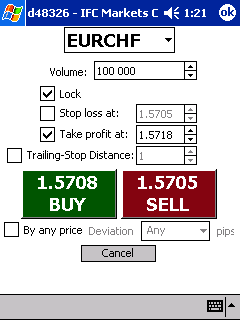 In this dialog you have to enter the volume of the opened position in the field “Volume” (in the first currency of the pair), set the connected orders “Stop loss”, “Take profit”, "Distance"-Trailing Stop", change the selected currency pair. To make a deal you should press the button “BUY” for buying (open position for buying) or the button “SELL” (for opening position for selling). The current quotation of the currency pair appears on the buttons. To cancel the order you have to press the button “Cancel”. A window with the result of the order appears after the transaction has occurred (it is closed by the button “Ok”). If the order was not performed, the reason is shown in the window. The results of the opened position are shown in the information windows - “Positions”, “Sum positions”. "Close position" window pops up in which you can either press "Close" to close a position at a price displayed on the button or abort by clicking "Cancel".